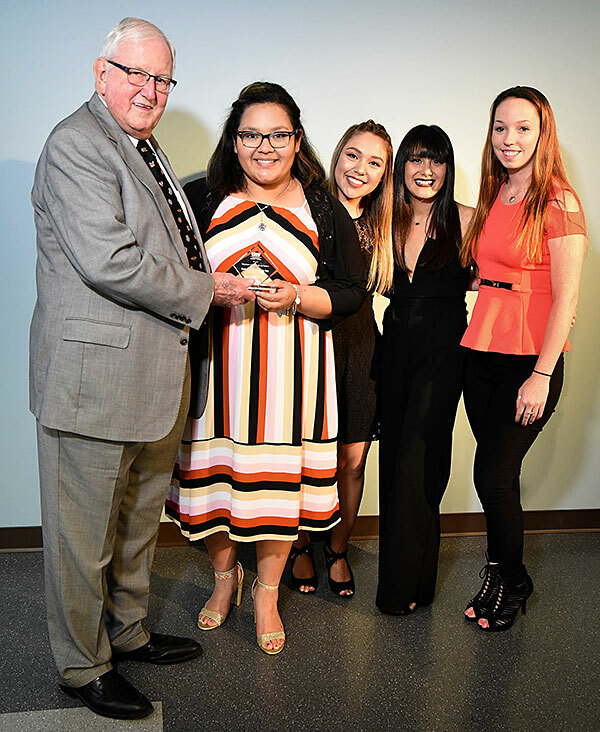 Members of the UHV Jaguar Cheer Team accept the Student Organization of the Year award Tuesday from UHV President Vic Morgan, left. Accepting the award are team President Jacklyn Medina, second from left, member Genesis Corona, Vice President Sophia Espinoza and Treasurer Nicole Hardin. The University of Houston-Victoria Jaguar Cheer Team members usually are leading others with cheers and applause, but this time, they were the ones being applauded and encouraged. The Jaguar Cheer Team was named the Student Organization of the Year on Tuesday during the UHV Student Organization and Leadership Banquet. The organization was founded four years ago by Jacklyn Medina, a senior from San Antonio. Team members cheer on UHV athletics teams as well as participate in and assist with student organization events. A total of 125 students, faculty and staff attended Tuesday’s banquet. It was the fifth time UHV has held a formal event to recognize student leaders and organizations. The Student Volunteer of the Year award was presented to Jocelyne Martinez of Austin. Martinez has participated in several civic engagement activities throughout the year, including the Alternative Spring Break trip to New Orleans in March and the October Jags Join In – Day of Service trip to Rockport to help clean up after Hurricane Harvey. 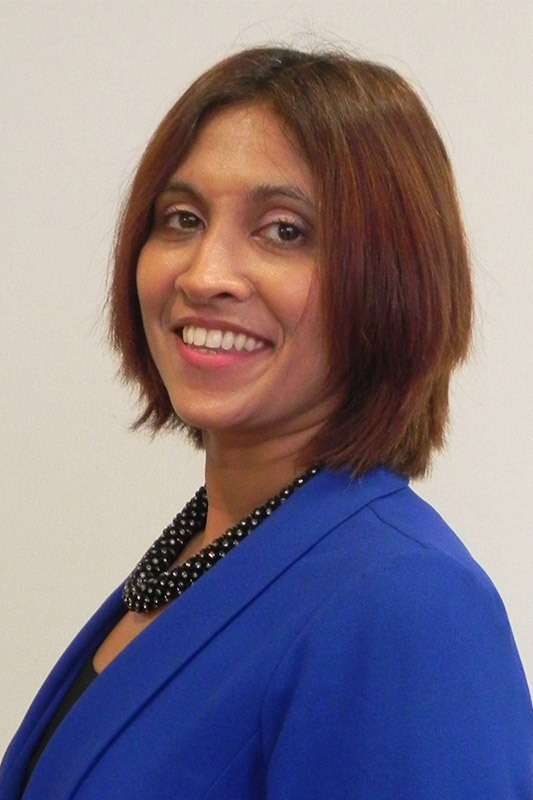 Ludmi Herath, UHV International Programs director, was named the Student Organization Advisor of the Year. Herath is the advisor for the International Student Organization, which is made up of UHV international students and presents events such as cultural displays and the annual UHV International Festival. Julian Carrizales of San Antonio, Cesar Gonzalez of Rosenberg, Randall Jasek of Palacios, Kevin Moreno of Houston and Keir Walker of Victoria were recipients of this year’s Spirt of the Jaguar award. The award recognizes integrity, citizenship, academics and respect. 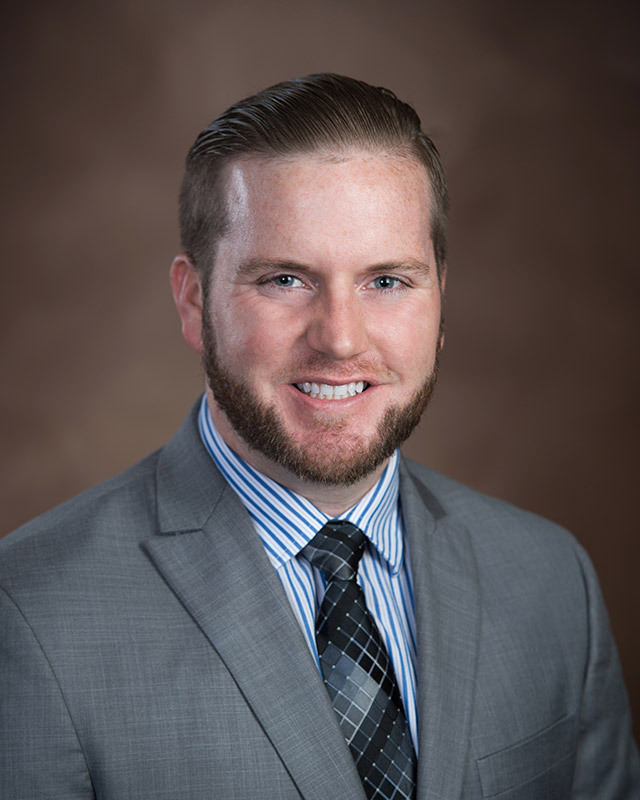 Students selected are actively involved in student life and encompass what it means to be a UHV Jaguar, said Michael Wilkinson, director of UHV Student Life & Services. Two students were recognized for earning ROAR Certified Leader certifications in one or more of four areas: communication, problem solving, social responsibility and teamwork. Treysi Diaz Deleon of Dallas earned a certification in all four areas, earning the title of Distinguished ROAR Certified Leader, and Chanel Hicks of Baytown completed the social responsibility certification. In addition, three students were awarded Student Government Association Senior Scholarships. The scholarships benefit upperclassmen who possess strong leadership characteristics. The first place scholarship of $1,500 was awarded to Sophia Solano of San Antonio. The second-place prize of $1,000 was given to Demi-Lee Ibarra of Brownsville, and Jaiden Lauderbach of Haltom City received the $500 third-place scholarship. During the ceremony, a special announcement was made concerning the Leadership Legacy Award. Beginning in the 2018-2019 school year, the award will be renamed the Dr. Vic Morgan Leadership Legacy Award to honor UHV President Vic Morgan, who is scheduled to retire in August. In addition to awards, Alvaro De La Cruz of Converse gave his farewell remarks as the 2017-2018 Student Government Association president and installed the next group of officers. Deshavian Williams of Wharton will begin his term as the association’s president on June 4.